“God never gives us discernment in order that we may criticize, but that we may intercede. Theirs was a marriage with a calling right from the start. She had abandoned her dream of being a missionary in order to be a wife and mother; he had committed all of who he was to be an evangelist. Billy and Ruth Graham changed the world with the gospel, and at the same time modeled a marriage defined by both passion and prayer. Make it a point to begin every single day bathing your marriage in prayer. It doesn’t have to be long, but it has to be authentic. Thank God for your mate and pray for his will to be manifest in your mate’s life. Pray that your spouse will grow spiritually and emotionally, and even be healthy physically. Ask the Lord to surround your mate with godly relationships and clearly reveal His purpose for him or her. Then after you have prayed that, and more, pray for yourself, each day asking the Lord for the same things for you and that He will give you a gentle spirit toward your spouse. Ask Him to cause you both to be friends and lovers, adventurers together, and prayer partners for each other. 1 Tyler O’Neil, “A Model of Marriage Partnership,” Christian Post, February 14, 2014, http://www.christianpost.com/news/a-model-of-marriage-partnership-the-lifelong-love-of-ruth-and-billy-graham-114578/ . This passage is from the Kingdom Marriage Devotional by Tony Evans. 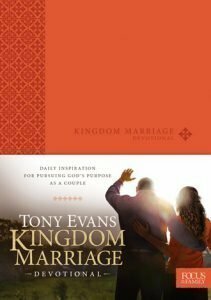 View the entire Kingdom Marriage collection on Tyndale.com .